Who Is the Expedia+ Voyager Credit Card From Citi Good For? If you book hotel stays with Expedia, this premium credit card is the best way to get you some extra points. There is another, no-annual-fee Expedia credit card, but as it often happens, the annual fee comes with some nice benefits. There are two slightly different offers that are currently available for this card: on the Citi website and on the Expedia website. Which one to choose depends on your goals. The Citi offer puts more cash in your pocket, while the Expedia offer gives you more points. Both award you a +Gold status, which is the highest Expedia elite status that and it will earn you 30% more points. Regardless of where you apply for the card, you’ll get a $100 airline incidental credit that covers baggage fees, Global Entry/TSA Pre, checked bags, in-flight food, drinks, entertainment, and onboard internet. If you apply on the Citi website, you’ll get a $100 statement credit after your first purchase over $100, and 20,000 Expedia+ points after spending $2,000 in three months. If you apply on the Expedia website, you’ll get 25,000 points, but no statement credit. You will also get an anniversary bonus of 5,000 points if you spend $10,000 in the first year. 4 points per $1 spent on Expedia purchases, including flights, hotels, activities and vacation packages. 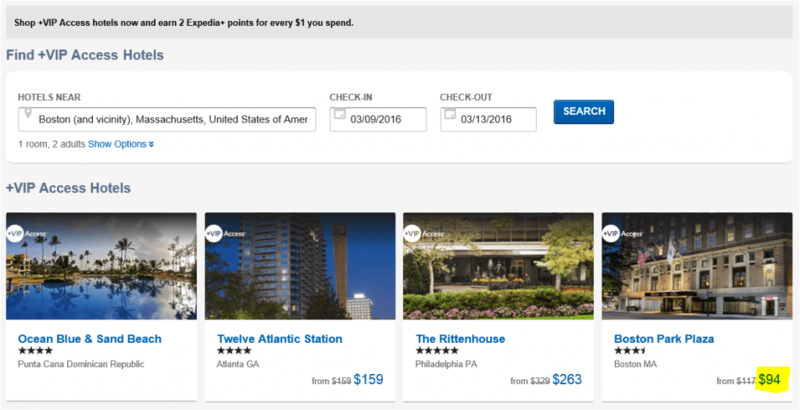 As a giant travel aggregator, Expedia lets you use your points to book all kinds of travel, including flights, hotels, cruises, car rentals, etc. However, you will get the most out of your points if you use them on the +VIP Access hotels. The minimum redemption is 3,500 points, and while most award bookings at Expedia yield much less than one cent for a point, there is one exception. 3,500 points would get you a $50 coupon (over 1.4 cents per point) if you book your stay at +VIP Access hotels. There are 1,800 +VIP access hotels worldwide, and most of them are upscale and expensive properties. However, there are exceptions, and sometimes Expedia runs really good sales. Finding a reasonably priced +VIP hotel might not be an easy task, since Expedia doesn’t let you sort the results this way, but you can try one of the two links to search properties. If you can work your way around the +VIP Access hotels, then one credit card sign up bonus can get you 3-4 free nights with a bunch of useful, money-saving benefits.